Vintage posters never go out of style. 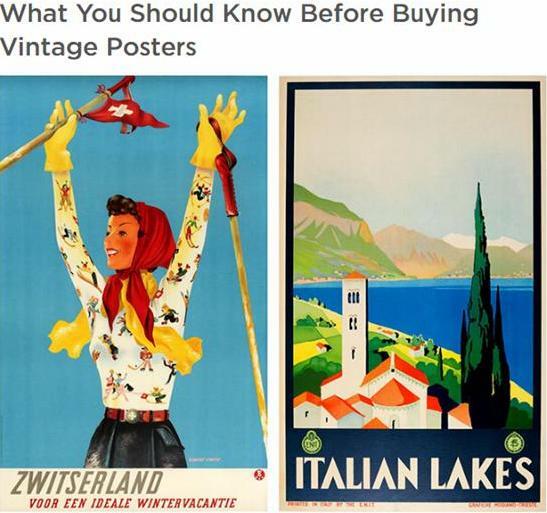 Collected by lovers of art, antiques, and design alike, “posters feature in so many areas of life,” says Kirill Kalinin, founder of one of London’s premiere antique poster shops. Kalinin runs Antikbar Original Vintage Posters, which shares a collaborative relationship with California-based poster restoration company Poster Mountain. Kalinin began as a collector of Russian posters from the 20s and 30s. Poster Mountain’s founder John A. Davis has been working in paper conservation and restoration for over 20 years. Both Kalinin and Davis are true poster devotees: between them, they have seen some of the rarest and most sought-after posters in the world. Film posters are some of the most expensive and coveted in the world, but in this category, their design often comes second to their content. “With film, there’s a heavy base of collectors in Hollywood. [Many collectors] tend to go after early stuff. Early horror film posters are particularly collectible,” Kalinin says. When it comes to extending the life of an original vintage poster, there are two schools of thought. One is to conserve it to prevent further deterioration, but retain some wear and tear as evidence of its age. The other approach is to restore the poster to something that looks as good as new. Vintage poster conservation and restoration studio Poster Mountain generally recommends a combination of the two. In terms of conservation, specialists must decide whether a poster needs to be linen backed, paper backed, or flattened. Posters should be hung behind UV-protective glass and displayed out of direct sunlight to prevent fading. If not on display, official guidelines state that posters must be stored flat, but both specialists concede that many people generally do not have the space to do so. In these cases, posters can be stored rolled in a tube, provided they are off the ground, out of direct sunlight, and in a room without excessive humidity. - Turn it over. According to Kalinin, the earliest posters tended to be stone lithographs or lithographs. The lithographic process creates rich, strong color that should last a long time. Because these paints contained oil, and old image will sink through to the reverse of the poster with time. If you can see an outline of the image through the back, that’s a good indication that it is original. - Look for uniform color. A close look at the poster’s colors should show uniformity. Any pixelation or dots suggests that the piece is a reproduction. - Look at the paint texture. The silk screen printing process tended to result in a thicker layer of color on the paper. This is prone to cracking over time, so if you can see or feel cracks in the texture of the paint, that’s another sign it’s an original. - Look at the margins. There will likely be text in the margins. If it’s in a different language from where the poster should have been printed or if the text is blurry, the poster may be a reproduction. - Look at the font. If it looks like a modern font, it probably is. - Steer away from purchasing a reproduction. - Have patience when searching for additions to your collection.If you’re not sure what you’re looking for, use an auction catalogue to help you get your bearings. This will offer a variety of posters from different periods with different subject matter. - Once your tastes have developed, don’t regret buying something that you no longer like; it’s just part of the learning process. - Always leave restoration to the experts. Attempting restoration yourself risks devaluing the poster significantly. There is a great deal of nuance involved in poster restoration. - The biggest mistake that collectors usually make is mending tears with pressure-sensitive tape such as scotch tape. It complicates, and makes much more expensive, the task of professionally restoring the object. Often, tape removal can result in severe damage and paper conservators have to take more extreme measures to cover stains caused by putting tape on a poster.